The objective of Imperial Japan in occupying the Dutch colonial oil resources in the Netherlands East Indies and on Borneo was realized shortly after the initiation of hostilities against the Allies on 8 December, 1941. This important oil resource was unavailable to Japan, since prior to hostilities, the Allies had denied Japanese access to the oil that would, it was hoped, prevent Japan from its expanding pan-Asian ambitions that were too often being realized at the edge of the sword. The subsequent campaign by the Allies to either destroy or recapture these Dutch assets fell to General MacArthur and his Fifth US Army Air Force, commanded by Maj. General George C. Kenney. 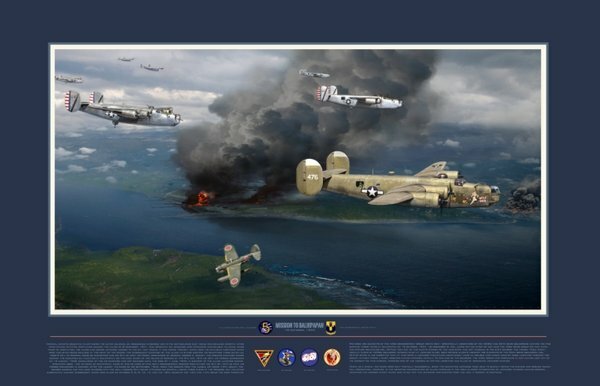 The ensuing campaign waged against the occupied oil facilities at Balikpapan on the east coast of the island of Borneo by the 5th USAAF commenced on 13 August, 1943 and was not concluded until the raids commencing on 1 June, 1945 in support of operation OBOE were completed (in support of OBOE landing forces). Raids by heavy bombers of one or more of five heavy bombardment groups from both the 5th and 13th US Army Air Forces commenced in earnest after the August ʼ43 raids on 29 September, 1944 when two groups from the Jungle Air Force, the Bomber Barons and Long Rangers, and the Jolly Rogers from the 5th USAAF attacked Balikpapan, losing three B-24s in the process, but inflicting substantial damage. Subsequent raids took place on October 3, 8, 9, 10, 14, and the 18th - with the raids on the 10th and the 14th being the largest and most destructive. Pictured are elements of the 403rd Bomb Squadron and the 65th Bomb Squadron leaving the two burning target sites at Balikpapan on 10 October as described by Col. James Pettus after he lead the 43rd BG on that day. The picture replicates his view out of the lead Liberatorʼs pilotʼs window. His left wingman is the nearest B-24, "WOLF PACK" which was usually flown by 403rd Bomb Sqdn. pilot Lt. Leonard Clark. Beyond Clarkʼs aircraft are elements of the 65th Bomb Sqdn. Col. Pettus notes in his narrative that at this point, a Japanese float plane inexplicably made an oblique high-angle head-on pass through the group, without firing a shot, perhaps having intended initially to ram one of the bombers. The 43 BG lost no aircraft to the enemy defenses on this mission, however one of the aircrew on Col. Pettusʻ aircraft was killed by Japanese defensive guns. Taken as a whole, the raids were only partially successful, since the occupying Japanese could quickly repair damage and resume production, however in the meantime the construction of Allied airfields in the area allowed interdiction of petroleum shipments out of Borneo, achieving the desired effect which was to cut off the Japanese war machine from the fuel it needed to continue.